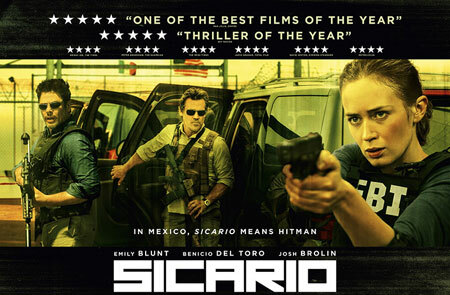 Emily Blunt stars in this dark, gritty and compelling drugs cartel thriller. Kate Macer (Emily Blunt) is a dedicated FBI agent with an impressive track record of responding to escalated drug cartel activity on the border between the United States and Mexico. Her efforts bring her to the attention of task force leader Matt (Josh Brolin) who enlists her skills to help bring down a notorious yet elusive cartel figurehead, one responsible for the violence that has swamped towns on the Mexican border. Teaming with Matt and the mysterious Alejandro (Benicio Del Toro), Kate soon realises that she's caught up in a bloody conflict beyond her understanding. Before long, she begins to question her loyalties, as well as those of her superiors. The Devil Wears Prada actress Emily Blunt goes gritty in this compelling and atmospheric thriller from Prisoners director Denis Villeneuve, one that plunges audiences into a violent world where no-one can be trusted.